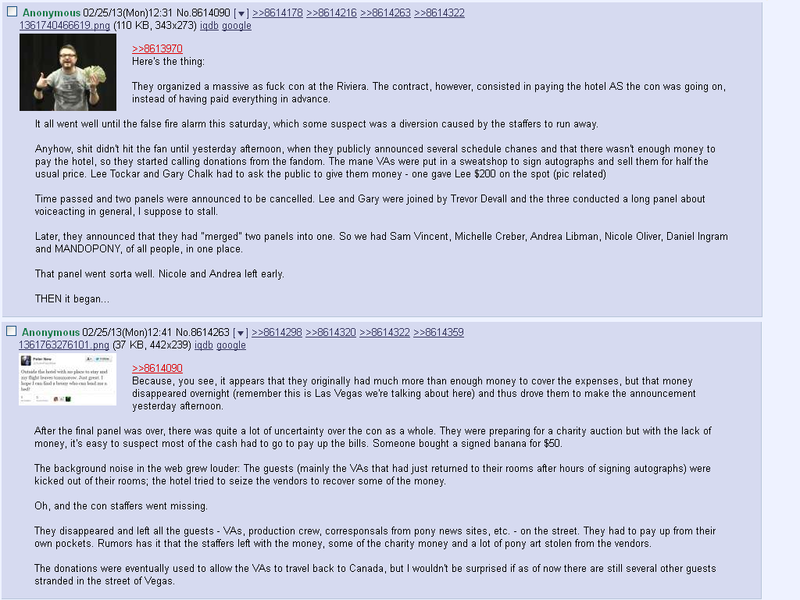 Reports are coming in from all over the internet (check the bottom of this) that a My Little Pony convention in Las Vegas this weekend melted down big time. Add to that the general confusion before we get an official response from Unicon who was putting on the convention, and people being ejected from the hotel, we end up with a full blown convention melt down. Efforts are still being made to coordinate the relief movement for the affected attendees. If you went to Las Pegasus Unicon and were unfairly charged or otherwise harmed by the events of the convention, please head here and fill out this form, so those coordinating efforts to help out can best figure out who and where to send help. I’m sure you’ve been hearing by now that some very unfortunate issues left a lot of people who attended Las Pegasus Unicon in some financial pain. Many of these attendees were ordinary con goers without a lot of ability to deal with the sudden financial hit caused by the fallout from this incident, most especially those with comped rooms or who booked at the convention rate only to suddenly find themselves double charged by the hotel. How can I help? This website is setup to provide a central point for fundraising and information. Click the “Auctions” button below to go to the auctions website where you can bid on various items submitted by the community. You can help by buying anything on the auction site or by simply letting others know of its existence. Interesting conversation thread on the melt down in action at this address. There is a really interesting conversation going on over there about the relief efforts for people who were ejected by the hotel, or were otherwise adversely impacted by the shutdown of the convention. The Finally the official statement from Laspegasusuicon about what happened, partially copied over here, check out their full statement on their site. While at no point did we abandon Unicon, at about 2:00 AM Sunday we realized that events had escalated beyond what our experience and staff could manage, and thus effective management was transferred from us to EFNW. At this point, we were grateful for the willing assistance from our fellow Bronies and had long since discarded any thought of recouping our personal losses into a goal of giving the best time to the attendees there on Sunday. We did our best to help these more experienced folks salvage the convention, and many crises were averted with their guidance. However, when it came to monies, the hands of the stars’ agents were constantly being filled. Whether it be from autographs, auctions, or personally removing T-shirt sale money from the cash box. Due to the chaotic nature of the con at this stage of the game, and a complete and utter refusal of the agents to sign records, an exact ledger of what was received by the agents on Sunday is impossible to produce. In all this is one interesting way of watching a convention melt down. There will probably be a lot of hand wringing in the convention scene about this one, especially the durability of the My Little Pony convention process. While we should all wait to see what the law says, it will be interesting to see what ends up happening here. 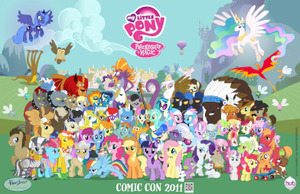 My Little Pony: Friendship is Magic- Season 4, The Trials Of Alicorn Twilight?